PIMSY is a cloud based EHR solution for mental/behavioral health and psychiatry & substance usage. It caters primarily to small and midsized clinics across United States. Apart from core mental health solution, it also offers practice management, billing, HR and custom development services within the same suite. The hybrid solution offered by PIMSY can be deployed both on premise or hosted in Microsoft Azure cloud. It is accessed from a non-browser-based program installed on any Windows-based device. 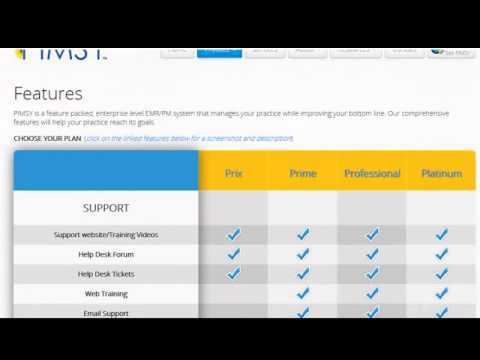 PIMSY is offered in three different pricing plans: prime, professional, and platinum. The product offers HRM features with which, administrators can create role-based security on particular files, track employee documents and assign multiple users to different areas in the system based on criteria such as department divisions and office locations. The billing and payment module allow users to generate billing statements, create invoice, track patient’s payment history and print expense reports. Other features includes personalized calendar, immunization tracking, electronic signature pads, scheduler for medical professionals, and an activity feed module based on department divisions. PIMSY has fully incorporated the DSM-5 standards, which include ICD-10 codes and is also HIPAA compliant in the Cloud. The product provides technical support to its end users via phone, email, web meeting, support site, online training videos, help desk tickets and a community forum. Software by Smoky Mountain Information Systems Inc. I would highly recommend Pimsy to other therapists who are looking to streamline their paperwork at a reasonable monthly cost. To me, the most important thing about an EMR is to have the features that you need, have it customizable to your business, rather big or small, and to be able to use those features. I don't care if you have the best program in the world, if you can't use it, then it doesn't help you. Pimsy has the features that I need and the customer support to teach me how to use them. I feel my hours of research for a good EMR company has paid off. Pimsy more than pays for itself by streamlining my office, improving efficiency and reducing billing times. I would recommend this to anyone looking for a good EMR company that will help you implement its program and help you with any questions you have along the way.I researched multiple EMR programs to find one that was affordable for a small business owner like myself, yet had all the features for a big company, so I could expand my practice. Pimsy was the clear winner. EMRs are completely new to me, and Pimsy was easy enough for me to implement and understand. With all technology and new programs, there is a learning curve, but Pimsy makes that easy. I can always call or email and get an immediate reply and if I need additional help, they will join me on my computer and walk me through exactly how to do whatever I am needing. This is all included in the monthly fee. I can now do my electronic billing that used to take days in a matter of minutes. No more searching for folders, spending hours on billing, trying to remember insurance authorizations. It is all here. Thanks to Pimsy, I am getting ready to add a therapist to my practice, because I now have the tools I need to effectively manage my clients, my billing, and more therapists. It helps us manage our behavioral health practice more efficiently. We are able to have a fully fledged EHR with a lot of features and a pretty nice interface at an affordable price. The software has everything you could want in terms of functionality for an EHR: automated billing, a nice scheduler that clinicians can perform all their tasks from (notes, etc. ), an extensive online patient portal, patient reminders, alerts, easy to use catalog of diagnosis codes, custom note templates and surveys. They thought of everything you could want and more and it offers a lot of customization. Efficiency in billing, accountability in documentation and billing, organized client data management system, electronic health record, improving auditing results.We appreciate that PIMSY is able to adapt to our agency's unique needs. With a variety of payment sources outside of the typical self pay and private insurance, PIMSY has been responsive to our requests for custom reports, invoicing, and processes to help streamline our billing. It has enabled us to be more aware of and efficient with our time, and recognize where we need to improve in efficiency and organizational processes. The reviewing and auditing features took us from 80% compliant to 99.8% compliant in one year! Our therapists tell us it is easy for them to document services, and our billing coordinator loves the accuracy in reporting and client data management. The training was flexible and responsive, and everyone we've worked with has been incredibly friendly. As a small not-for-profit, cost was a factor for us. We've gotten a lot of bang for our buck for this system, and it was worth the investment! PIMSY has been everything I've wanted and more all under "one roof". From client scheduling, billing, tracking, statistics and even sending client reminders. I am so much more efficient in my private practice now and wish I had discovered PIMSY sooner. I love how this product is so customizable and tailored to your specific business needs. This product has SO many options it's almost limitless. There is a learning curve, but the PIMSY staff's knowledge of the product, hands on approach and patience make learning the product much easier. They are with you every step of the way and very responsive when issues arise. The trainers are so personal and attentive, its like white glove service. They even have tutorial videos for additional help! For the last 20 years, I have tracked client payments using cumbersome Excel spreadsheets. Those days are gone, as PIMSY does that and more for me with the click of a mouse. PIMSY provides very detailed reports such as client payments, income for the month, insurance payments yet to be paid etc. as fast as you can click a mouse. One of my favorites is the ability to print a very professional receipt for a client within seconds. Progress notes, treatment plans, reminders of when your License expires or to walk your dog, PIMSY is a Clinician's dream. The fact that it's cloud based means I don't worry about losing my information and I run it off my Surface Book and Desktop computers. If you're searching for a product that does it all, stop and reach out to them, you wont' be disappointed.How its completely tailored to what you need and want. Its designed to make you efficient in your day to day activities. PIMSY is offered in three different pricing plans: Prime, Professional, and Platinum. The subscription is on a monthly basis. Contact PIMSY for pricing. •	PIMSY offers an integrated online suite for billing, scheduling, payroll and patient check-in. •	PIMSY offers a team note feature through which common team notes can be created and every member can add their remarks to the note. •	PIMSY allows doctors to prescribe medications, send patients to the pharmacy, track drug allergies and record medication allergies. •	PIMSY ensures the accurate reporting of inventory levels by automatically tracking the current status of available inventory and decreasing the appropriate number of units from the remaining units in medical stores. •	The client and patient portal allows users to submit and update their contact information, provide insurance details and also attach & download documents to their accounts. Below are some frequently asked questions for PIMSY. Q. What type of pricing plans does PIMSY offer? Q. Who are the typical users of PIMSY? Q. What languages does PIMSY support? Q. Does PIMSY support mobile devices? Q. Does PIMSY offer an API? No, PIMSY does not have an API available. Q. What other apps does PIMSY integrate with? Q. What level of support does PIMSY offer? Q. Which apps is PIMSY compared to most often?